This article is about men's association football. For women's association football, see Geography of women's association football. The following article gives a list of association football confederations, sub-confederations and associations around the world. The sport's international governing body is FIFA, but those associations not affiliated to FIFA are also included in this article. Most European, African, and Asian countries have two principal competitions: a more prestigious league which is typically a double round-robin tournament restricted to the elite clubs, and a cup which is a single-elimination tournament open to both the elite and lesser clubs. In the Americas, leagues are often organised as either multi-stage tournaments or separate Apertura and Clausura stages. World map of FIFA's six intercontinental governing bodies. 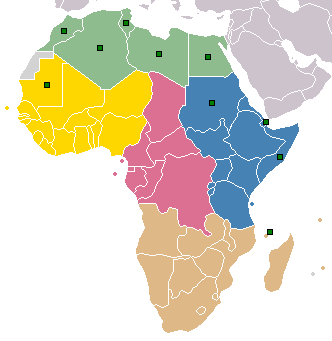 Map of CAF's five regional federations. Out of 22 members, the Union of Arab Football Associations (green dots) hosts 10 CAF associations. Map of AFC's five regional federations. The football associations listed in this section are members of FIFA-affiliated confederations. All UEFA associations are affiliated with FIFA. All CONMEBOL associations are affiliated with FIFA. The football associations in this section represent fully or partially recognized sovereign states or dependent territories, but are not part of FIFA or a FIFA confederation. Beneath the national level, governance of football may be divided up into regional or territorial associations. Other non-national associations represent stateless populations, diasporas or micronations. Details of these are listed at non-FIFA international football.